Last week, we reported that fans who buy a Sin City: A Dame to Kill For ticket will be the first to see a teaser trailer for Quentin Tarantino's upcoming Western The Hateful Eight. The catch is, it will not be debuting online. We know that this trailer won't contain any actual footage, since production hasn't even started yet, but Collider has a description of this teaser, which confirms the Western is being shot in 70MM Super CinemaScope. The story is set after the Civil War in Wyoming, and centers on a group of stagecoach passengers who get stranded together during a blizzard, with a majority of the story taking place in a dive bar. The trailer opens in typical Western fashion, with an unidentified ballad and title cards that set up these strangers being trapped together, followed by, "They soon discovered they shared a deadly connection." After another title card that reads "A Film by Quentin Tarantino!" 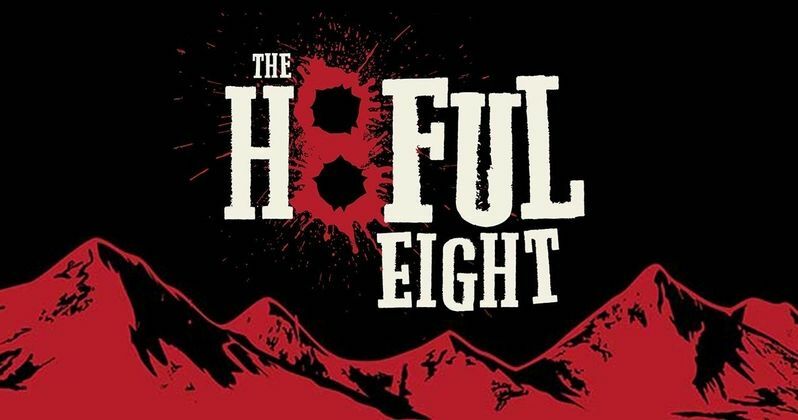 Major Marquis Warren: "The Bounty Hunter"
Oswald Mobray: "The Little Man"
Joe Gage: "The Cow Puncher"
General Sandy Smithers: "The Confederate"
After a set of bloody numbers counts up to 8, we see "8 Makes Hate," before gunshots "fire off" the "Makes" and "Hate" as The Hateful 8 title emerges. This is followed by "From Academy Award Winner Quentin Tarantino" and then "See It in Glorious 70mm Super Cinemascope" before confirming the 2015 release date. We reported last month that Quentin Tarantino plans on using his cast from the live reading of the script earlier this year, which includes Bruce Dern (The Confederate), Samuel L. Jackson (The Bounty Hunter), Kurt Russell (The Hangman), Amber Tamblyn (The Prisoner), Walton Goggins (The Sheriff), Michael Madsen (The Cow Puncher) and Tim Roth (The Little Man). James Remar and Zoe Bell weren't a part of the live read, but they'll have parts in the film. Are you excited to see this trailer for yourself in theaters? Chime in with your thoughts below. Hateful Eight: What Happens Next According to Walton Goggins?